This product is still one of the best, and easy to use fund raisers in the market place. With excellent payout and profit for your club or section. These can be sold directly to anybody...even from a pint pot from behind the bar...anywhere! The selling price is variable...10p, 20p, 50p, £1...YOU CHOOSE! The prize money is variable and decided by you! 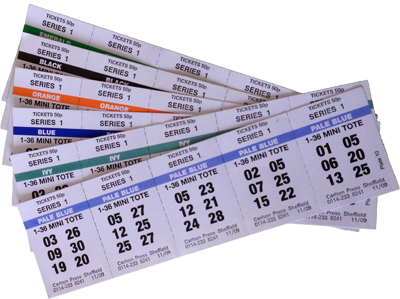 3 sets of double numbers printed on each ticket...(no doubles or reversed numbers) Your Club Name, Promoter. For Security: Printed series number, dated and ...20 colours! Small minimum orders - only 20 sets! low cost outlay supplied 5 tickets on a strip & perforated.